If a resident citizen of India leaves the country for an employment abroad or as a member of a crew on an Indian ship and stays in India for a period less than 182 days in a year, he or she will be considered non-resident Indian (commonly referred to as NRIs) for the income tax purposes. The Taxability of the NRI depends on whether the concerned individual qualifies for the status for the non-resident Indian for the year. A non-resident Indian is liable to pay income tax on the income which accrues or arises in India or where the income is received in India. Any rental income, interest on saving bank accounts or interest on the fixed deposit, capital gains (Profit on sale of capital assets) and salary received in India are taxable. If the non-resident’s taxable income exceeds the basic exemption limit, the NRI is liable to file the income tax return in India. However, there are few provisions in the Indian Income Tax laws wherein Non-Resident Indians can opt for special rates of income tax (instead of normal tax in India) for particular income from investments or capital gains arising out from foreign exchange assets. Further, where the NRI earns interest on his NRE bank account etc. is exempt from the purview of tax (subject to certain conditions). If a Non-Resident Indian returns to India and turns out to be an Ordinary Resident of India for a specific assessment year, then the NRI will be required to disclose all the assets located/situated in foreign (foreign assets) and his foreign income in the relevant income tax return. READ When can an Assessing Officer reject books of accounts? There are strict penalties imposed by the Finance Act, 2015 on NRIs for not disclosing the foreign Income. Such foreign undisclosed income henceforth would be taxed under the provisions of this new legislation on unaccounted money and not under the Income Tax Act. Where a Non-Resident Indian permanently returns to India after staying a few years in abroad, the foreign income of the NRI does not become taxable in India immediately. A person being an individual, who has been an NRI for consecutive nine years or more, remains Resident but not ordinarily for two years for taxation purposes, this status is a transitional status of an NRI to become a full-fledged resident Indian. Any income earned outside India during the transitional phase (till the NRI becomes resident in India) will not be taxable in India unless the income is from a business or profession having a setup in India or controlled from India. Once, NRI is a resident in India, his/her ‘global income’ (including income earned outside India as well) will be taxed in India. If an NRI receive any salary in India or someone receives the same on behalf of the NRI, the NRI will be liable to tax in India on such salary. The rental income is the very common source of income for NRIs. Any rental income earned by the NRI is taxable in the hands of Non-Resident Indian. This will be included in the Total taxable Income of the NRI and will be taxed at normal income tax slab rates. 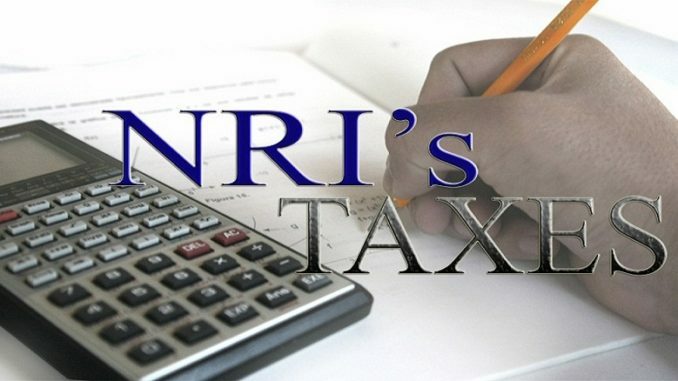 However, the NRI is also entitled to claim 30% from rental income as the standard deduction. Non-Resident Indians can also avail the deductions of home loan U/s 80C as well as the deduction of interest on home loan U/s 24 of the IT Act. Where an NRI earned any income from a business or profession having a setup in India or controlled from India shall also become taxable in India. So, if the NRI is getting some income via any business or profession in India, the same shall be taxed in his hands in India. Any Capital gains (long term or short term) arising from a transfer of the capital asset in India shall be liable to Income Tax. However, non-residents can avail a special provision related to income earned from investment. If the non-resident invests his money in India in certain specified investments, then the income earned from such shall be taxed at 20%. Debentures by public listed companies (not private companies). Deposits with banks and public companies. So, if a Non-Resident Indian has income only from the investments mentioned above and Tax on such income (TDS) has been deducted accordingly, Non-Resident is not required to file the ITR in such a case. In case NRI want to claim the refund of tax, he/she will anyways need to file their ITR. Interest earned on Indian Saving bank account and Fixed deposits during the year, shall be taxable in India. However, interest earned in NRE Account and FCNR Account is exempt from tax. May 25, 2017 Sourav Comments Off on Could you save yourself from the hands of income tax by transferring money to your spouse’s account?